Pilgrims from across the world gathered in Bethlehem on Monday for Christmas Eve, queueing to see the grotto where Jesus is believed to have been born and taking in a festive parade. Midnight mass was to be held in Bethlehem later, while Pope Francis was also due to hold mass at the Vatican as Christians celebrate the traditional day of Jesus's birth after a tumultuous year. Palestinian president Mahmud Abbas was to be among dignitaries attending the ceremony. This year, visitors are able to view the Church of the Nativity's newly restored mosaics after they were recently cleaned and repaired in a major project. A newer and more spacious church, St. Catherine, is located next door and is where midnight mass is held. 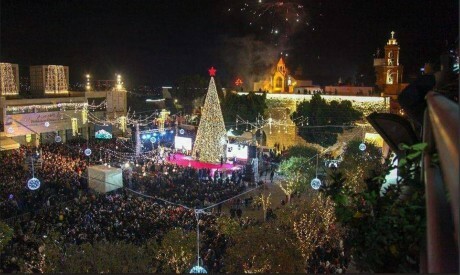 "This year is much more calm, much better than last year," said Abeer Nasser, a Palestinian from the nearby town of Beit Sahour who was with her son and daughter and was planning to attend midnight mass.